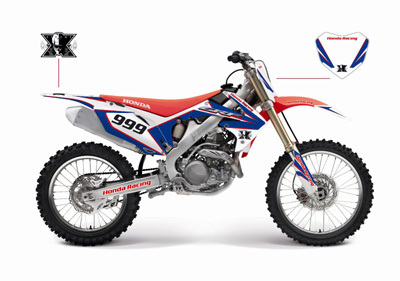 Honda (UK) announces limited edition ‘XTREME’ versions of the current CRF250R and CRF450R models, featuring striking tri-colour graphics, with a British twist. The limited edition XTREME livery – brings a taste of race replica to every rider, and for the patriotic amongst us, echoes the stylistic cues from the Union Jack flag. Rather poignant, given the series of summer events across the UK, encouraging us to celebrate everything great about being British. Produced by Zero nine, the graphics are in high-gloss with vivid, rich colour and are precision cut. Graphics can also be personalised with rider name and individual race number. For more information on the XTREME editions of the CRF250R and 450R or for further details on the Honda off-road motorcycle range, visit honda.co.uk.